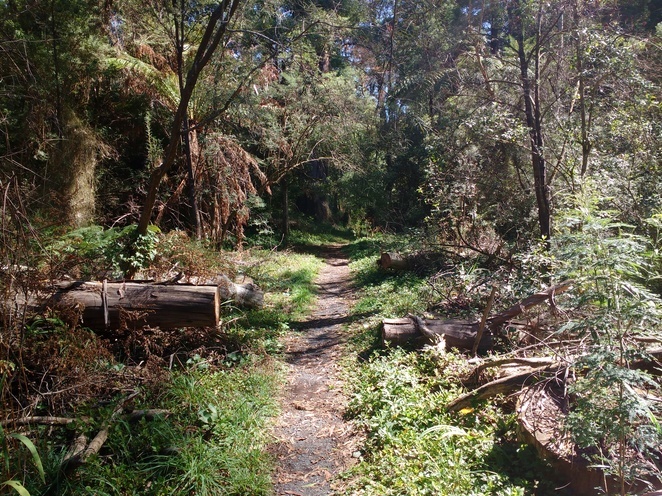 There are numerous walking tracks through the Dandenong Ranges. Some go up hill and down dale, some lead to waterfalls and others are simply tracks which allow you to experience the forest and nature in a peaceful and calm manner. The Sassafras Creek Track near Monbulk falls into this last category. The track itself is part of a much longer walking track from Sassafras to Emerald, but the section along Sassafras Creek is certainly the easiest and most accessible part of it. It's not flat, but it's not a hard walking track either. And the best part about it is, you can do as much or as little as you want or feel able to do. My walk started from Kensley's Picnic area on Monbulk Rd, and finished at Beagley's Bridge, a walk of around 2km which took 40 mins going at a decent speed. For a return trip, a time of around two hours or more is probably a reasonable time frame. Of course, you can start the walk from any of the picnic grounds along Monbulk Rd, if you want a shorter walk, or from Baynes Park in Monbulk itself if you want a longer walk. Or you can start from Beagley's Bridge and walk to Monbulk if you wish. The good thing about the walking track is, as stated above, the freedom to do as much or as little as you like. There is no ultimate destination, so you're not missing out if you don't do the 'whole' walk. Sassafras Creek is a constant companion on this walk, whether you are walking beside it, crossing over it or even walking high above it as you do in some sections. The fact that the walk does deviate up and down like this, and that there are parts with stairs, does mean some fitness and mobility is required to do it, but once again, the sections between the Monbulk Rd Picnic areas are quite flat and easy to navigate. Some sections of this walk are also in need of maintenance. There are areas of wooden boardwalks which would be very slippery after rain (the usual wire that is placed on wooden boardwalks has disappeared). 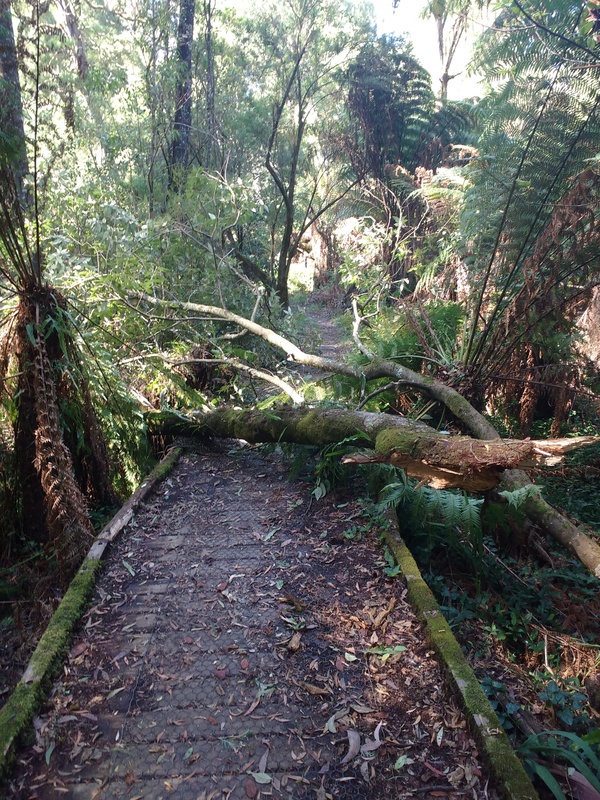 Also, at least when I walked it, there were a lot of trees down across the track, some of which did take a bit of effort to clamber over. It did add to the atmosphere of the walk, but it is something you should keep in mind before you go. 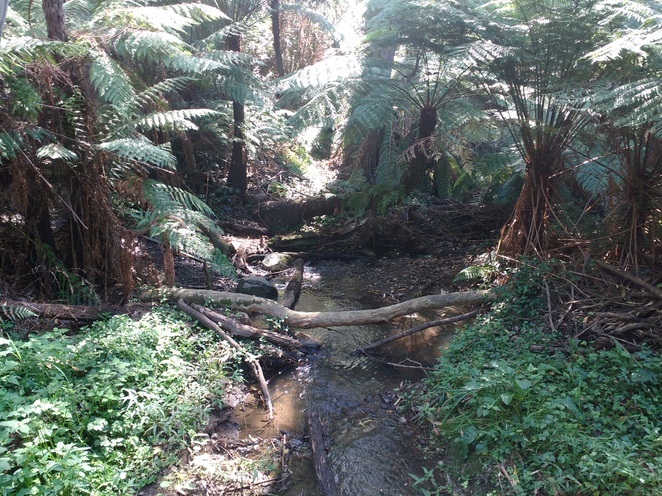 The walk itself takes you from the creek's valley where you are surrounded by tree ferns, and can listen to the sounds of the creek, through other areas, where the canopy opens right up and you are drenched in sunlight. And then further, up the side of the valley, into thick forest where you can overlook the creek below. At all times, you are relatively close to the road, but the traffic noise is hardly noticeable at any point of the walk. 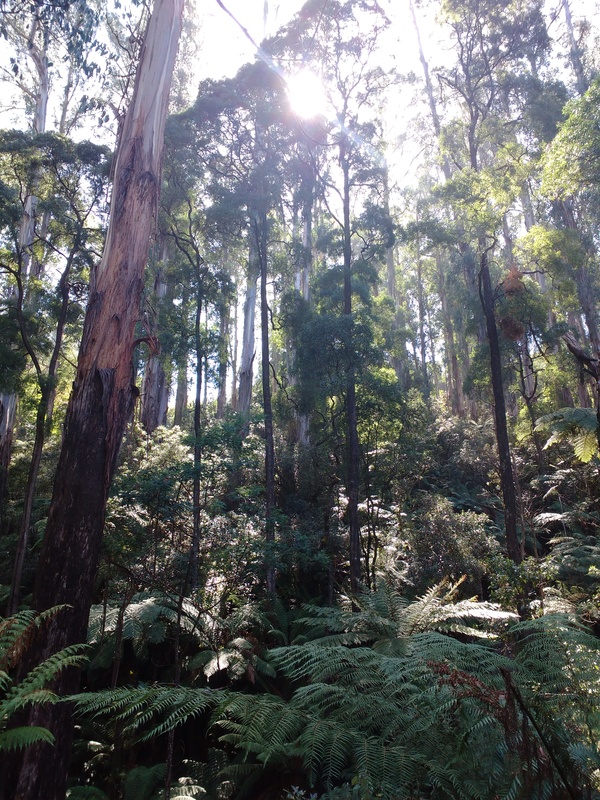 There are many options if you want to walk through the forests of the Dandenong Ranges, but if you want a simple walk with no purpose or destination then the Sassafras Creek Trail should be high on your list of options. Looks great! I wonder why it's called Sassafras Track?